When we entered the “Superior” era last year, one thing I thought would be explored with a bit more frequency is the idea that Peter Parker and Otto Octavius are two very similar characters that inevitably took divergent paths from each other as hero and villain thanks to one particularly life-changing moment for Peter involving the death of a certain uncle. Superior Spider-Man Team-Up #10 opens with a scene from Otto’s past that, thanks to a cleverly illustrated image from Marco Checchetto, could have easily been mistaken for Peter’s. Otto is being bullied by his classmates in school, and recalls how his desire for safety and security eventually evolves into power and vengeance. 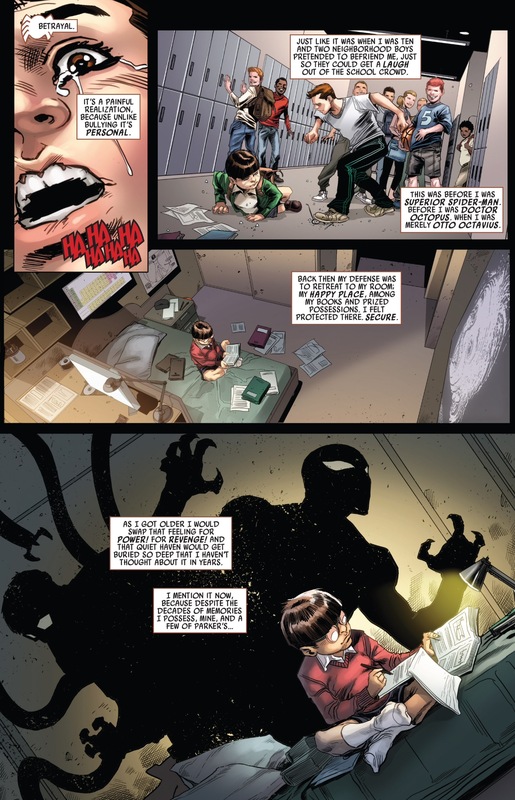 While everyone knows Peter as the man who lives by the adage, “with great power must also come great responsibility,” a critical piece of the character’s background is that prior to Uncle Ben’s death, Peter had planned to use his new spider-powers to make money on television and to “show” those who persecuted him (such as bullies like Flash Thompson) that he was above being picked on and tortured. If that doesn’t sound like lusting for power and vengeance, I don’t know what does. What has made the past year and change such an interesting ride is how Otto – despite inheriting some of Peter’s memories and emotions in Amazing Spider-Man #700 – never actually develops a true understanding of power and responsibility. 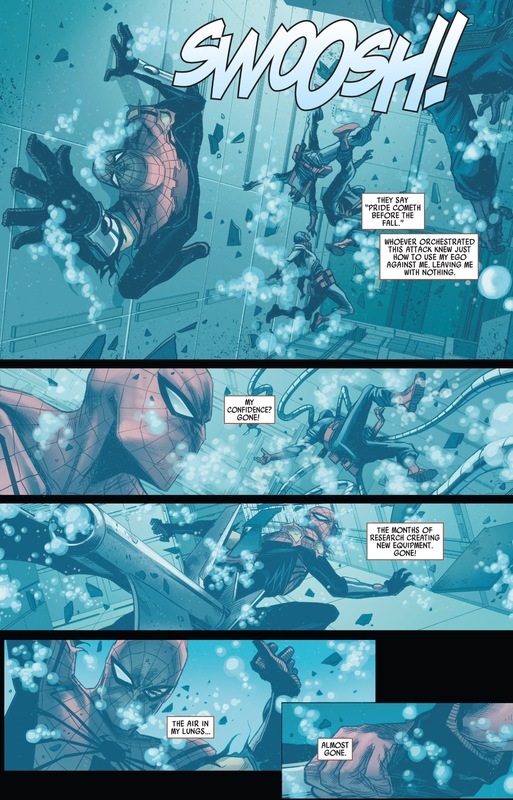 We witnessed during the great mindscape showdown between Peter and Otto in Superior Spider-Man #9, that Otto justified his actions in a “might makes right” fashion. That’s why Otto murdered Massacre, beat Jester and Screwball senseless and planted surveillance taps throughout New York City because while the morality of these actions is questionable, the ends justified the means, especially when you consider how they were fewer killers and criminals on the streets thanks to Otto’s interpretation of heroism. Simultaneously, it was inevitable that Otto’s warped sense of justice would eventually lead to his undoing. And while Ottos’ fall from grace has been long simmering for a few months now, Superior Team-Up #10 appears to mark his official impact with “rock bottom.” In a weird continuity glitch that might be about a scheduling snafu as anything else, Team-Up #10 is supposed to take place before the events of Superior #27 (but instead came out the very week after). I generally try to avoid getting caught up in minutiae like this, but there’s a part of me that would have preferred to read this story before that latest issue of Superior because I think it would have put the events of the main title in better context. 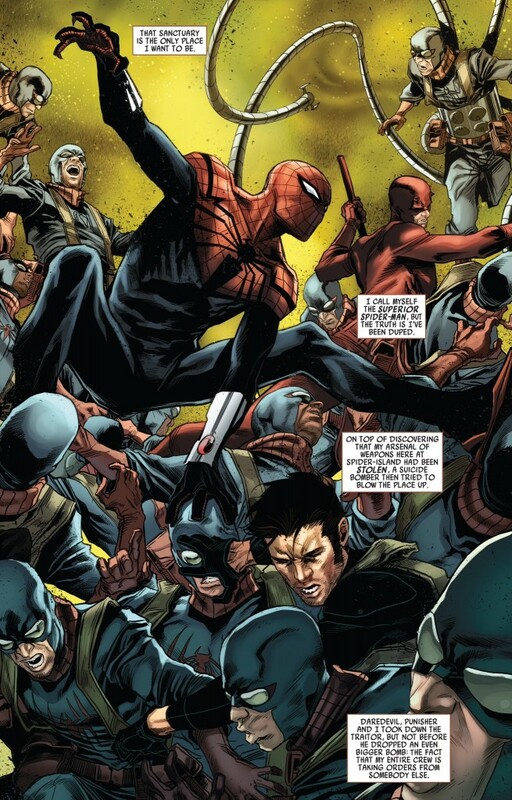 In this comic, Otto likens his current situation as the Superior Spider-Man – his Spider Island II base completely overrun with traitors and criminals posing as his henchman and his only allies being a guy who openly thinks there’s something “off” about Spider-Man (Daredevil) and another guy who is the epitome of a vigilante and anti-hero (Punisher) – to being bullied in school. It could be argued that the comic’s writer, Kevin Shinick, is stretching the plausibility of this analogy a little bit, but I think it’s a valid point. In Otto’s case, his memories from school marked a moment of powerlessness and helplessness. During the siege of Spider Island II, Daredevil asks Spider Ock to flood his base in order to wipe out all of the insurgent henchman who have overrun his sanctuary. Otto initially refuses because he argues that he only installed an emergency shutdown in case he was incapable of defending it. That’s when Daredevil had to point out that despite physically attempting to defend the base, he was failing, which meant it was time to shut things off and declare all costs sunk. During the course of battle, Otto manages to further alienate himself from Daredevil and Punisher, despite the fact that both were willing to come to his defense. Again, this plot development would have felt more emotionally significant if Team-Up #10 had come up prior to Superior #27 because it would have further illustrated and accentuated just how along Spider Ock is as he gets ready to take on the Green Goblin (whoever it is that ends up under the mask). 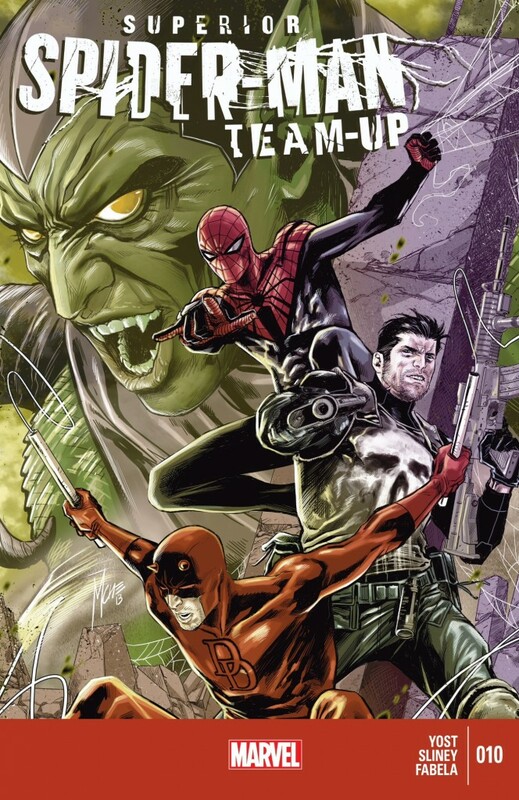 As it is, Team-Up #10 ends with the big reveal of Otto discovering one of his assumed henchman with a Goblin tattoo on his neck, signaling to Spider Ock that despite his best efforts to turn New York City into a police state, the Green Goblin’s rise to power has gone unnoticed until it was way too late to do anything about it. During this moment of discovery, Otto talks about his “Pavlovian” impulse that has him check the fallen henchman’s neck for a sign of who was behind the attack. “There’s only one person I know who can get into a man’s mind like this … Who would strike on such a personal level,” Otto says. It’s yet another reminder that not only does Otto occupy Peter’s body, but the two share far more in common than both would like to admit about each other.